My buddy Jonathan Salomon recommended me to read Peter Thiel’s book “Zero To One” back in 2015 already and I only came around to finish it this week. Not only was I totally inspired by reading it, but also regretted not reading it earlier! It was an easy and fun read. Although the topics and main subject are very philosophical and ground-breaking (actually), the book is ‘light’ and easy to read with great examples to accompany the theories projected. So, what was so inspirational and what did I learn? As an entrepreneur I love to read books written by other entrepreneurs and what mistakes they made and especially what makes the successful. Peter Thiel is one of the founders of PayPal and later on teamed up with fellow futurist and serial entrepreneur Elon Musk (a.k.a. Mr. Tesla). 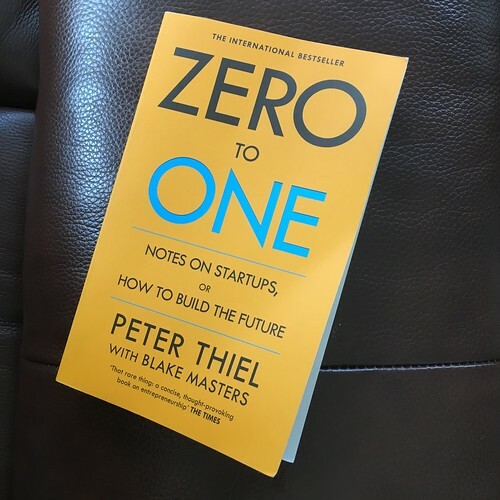 If you like reading books about successful entrepreneurs, business books and/or innovative/new theories, Zero To One is a must-read book for you! ALWAYS ASK THE CONTRARY QUESTION! Most answers to the contrary question are different ways of seeing the future and therefore unlocking the future! The book starts with Thiel explaining thath he asks every applicant during a job interview this particular quesions; “What important truth do very few people agree with you on?”. A very simple quesion, but very hard to ask. I immediately tried to answer the question for myself and after a few moments of tranquilly thinking I came up with an answer. After finishing the book two days later, I re-asked myself the question and came up with another question. I advice you to answer this question for yourself now. At the end of this blog post you can read my initial and final answer. Obviously if one doesn’t have good answers to these questions, one will run into a lot of bad luck and most probably fail. Answering all seven positively will most probably lead you to fortune and success. And, getting five or six correct might work. A company that nailed all seven is Tesla according to the author. In my opinion the seventh and last question, The Secret Question, is the most important question and is the main theme of the Zero To One Theory: ask the contrary question to find novel views & ideas. To go from zero to one, to make something from nothing and not copy something existing and make it slightly better. Thiel urges to find new ways to grow exponentially! To finish this blog post, I said I would give you my answers to the question Thiel asks every applicant during job interviews: “What important truth do very few people agree with you on?”. As Thiel starts his book with this question, I initally answered the following before finishing the first chapter: “I believe that it is an important truth that retailer businesses that do not convert their traditional brick-and-mortar operation to an omni-channel business before the year 2020, will die. Especially businesses/companies that sell luxury products!” I beliee this is true and I am believing this already since 2008, hence we transformed our family business Ace Jewelers from a classic boutique business into the first luxury jewelry business to sell online and be authorised by premium luxury brands. In 2008 many people did not agree with me and unfortunately few people still today agree with me. When I continued reading and finished reading this awesome book two days later, I noticed that Thiel is more of a philosopher than a mere businessman. He is a visionary, like his buddy Elon Musk. Really inspiring. What he means with this question is that we need to seek secrets that are hidden and contain the answer to a better future and the way to find them is by asking the contrary question… Most answers to the contrarian questions are different ways of seeing the present. So, looking at the big picture like he Thiel wants you to look at it, my answer became: “Why do people fear change? Because people are afraid of the unknown. To accelerate progress and innovation, one will need to both break dogma and take away ignorance.” So, therefore my answer to the question of what important truth do a few people agree with me on is: “Breaking dogma and fighting ignorance will propel innovation and progress.” In simple language: “We need to teach kids to think more out-of-the-box and basically give them space to grow-up like entrepreneurs. To teach that if one has different views, that does not make the outsiders and that there is no wrong if they do not copy/paste their parents/friends. Only being different can truly make society progress.” It seems my answer sounds simple and logical and obviously not a few people agree with me, but a majority… But, think twice… The majority loves their old rusty ways and are scared of change. Like Thiel writes on page 63: “Every culture has a myth of decline from some golden age, and almost all peoples throughout history have been pessimists. Even today pessimism still dominates huge parts of the world.” But, I am positive and an optimist by nature and therefore really believe we are at the verge of a(nother) great change in society/societies and the world.